The apology part: I did not get a post up about the Wilkinson Summer Lecture series when I should have (the flyer is here). In spite of my dereliction, there was a good audience on Monday for Paul Delange’s talk about Comfort, Michigan, a ghost town on the abandoned rail line between Alden and Bellaire. 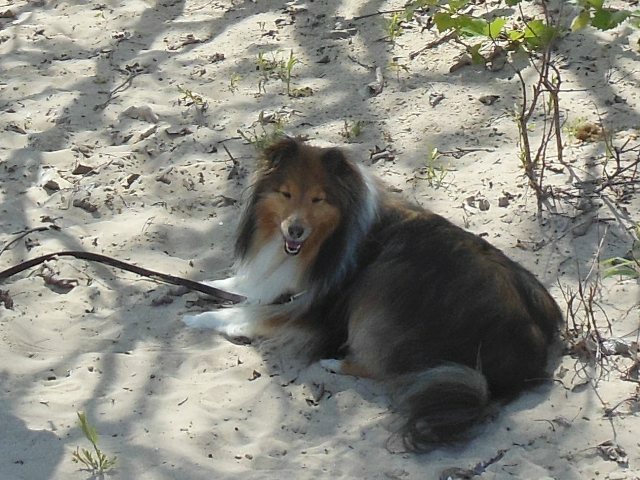 Paul knows a lot about the history of the Grass River Natural Area and the railroads of northern Michigan. I will make it up to you by telling you more about him soon. My excuse: It has been anything but a quiet week in the Township. Once our reluctant spring finally emerged we were flung straight into summer. 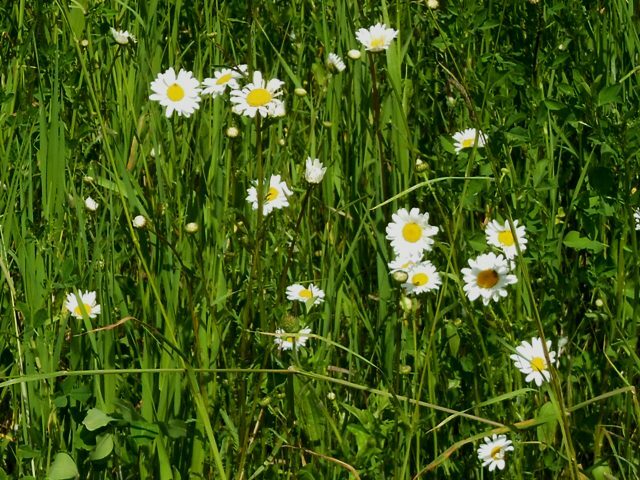 We are awash in green leaves and cheerful wildflowers. 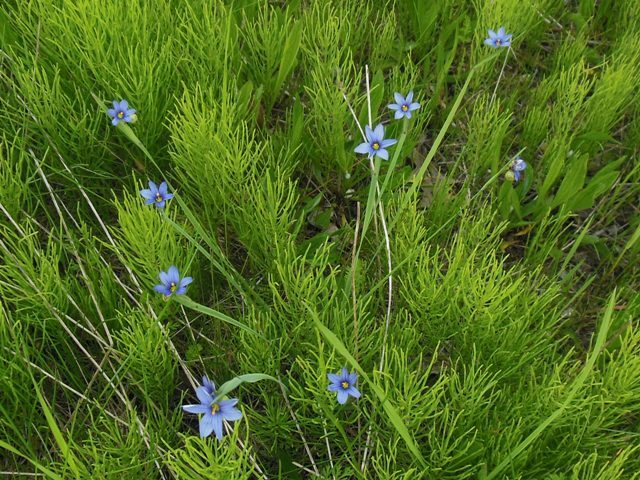 On the roadside north of Elk Rapids the cowslips have given way to wild yellow irises, blue-eyed grasses and daisies. I’ve had lots of opportunities to monitor the roadsides as I am commuting to a new job at the Elk Rapids District Library (Island House). I have always loved spending time there. Now I am unaccountably being paid to be there on occasion. This strikes me as a wonderful development. You may be sure you will hear more about it. The ArtRapids! 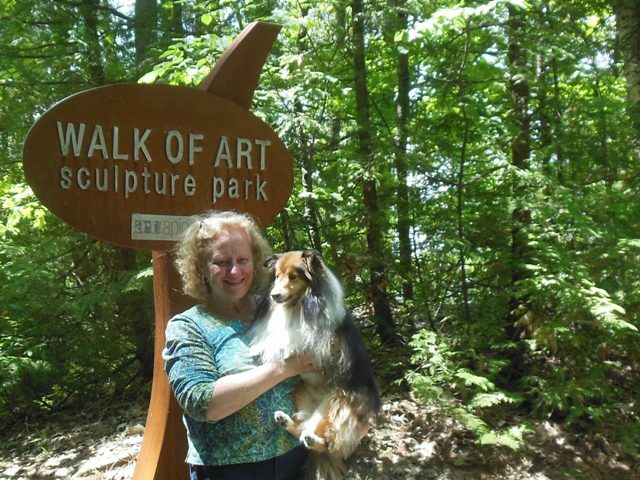 Walk of Art sculpture park has been attracting many visitors, including Dawn Kinster of the Change is Hard blog and Katie, the princess who lives with her. They braved the mosquitos to camp at Hartwick Pines last weekend, and came to Elk Rapids to visit us while they were at it. We took a tour of the village, where the lilacs are in full, fragrant bloom. Neither Dawn nor I could remember seeing two-toned lilacs before. We liked them. Katie had no comment. We had lunch. We did a little window shopping. We went to the beach. Everywhere we went people admired Katie extravagantly. It’s exhausting to be a princess. On Thursday I persuaded Louan to meet me at the Garden Cafe at Pine Hill Nursery for a little supper. 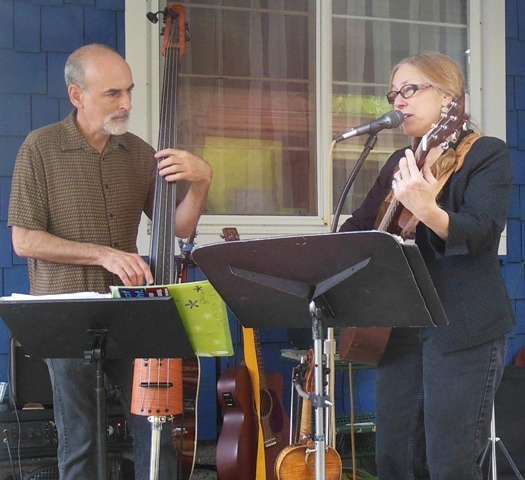 The new wine bar was open, the wood fired pizza oven on the patio smelled really good, there are flowers everywhere – and Robin Lee Berry and Glenn Wolff were busy making the music of the north country. They are subtle and witty artists and very, very good. They will be at the Cafe every Thursday this summer. There’s a happy thought. The pizza is tasty and exceedingly fresh. 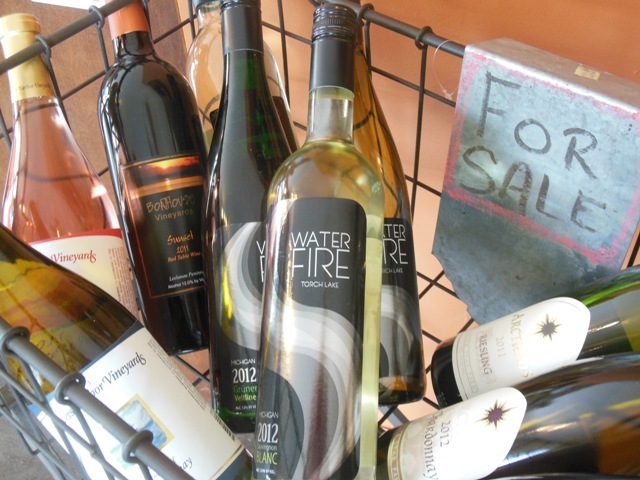 There is a nice selection of local wines (try the Gruner Veltliner from Water Fire vineyards on Torch Lake), beers and nonalcoholic beverages to go with it. 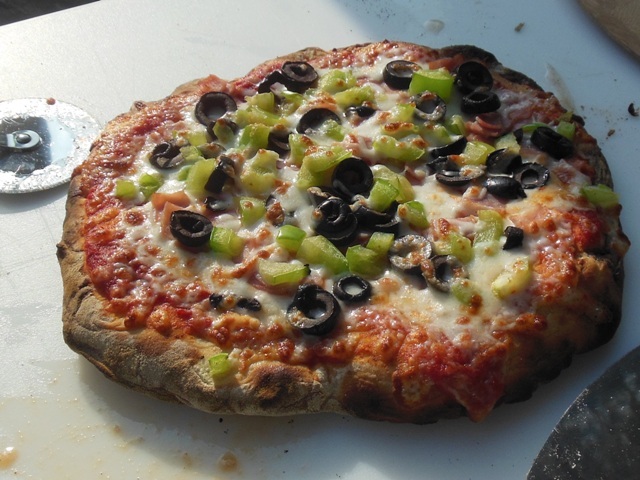 There are lots of other good things to eat, too, but I was obsessed with the pizza. I don’t see how you can go wrong. 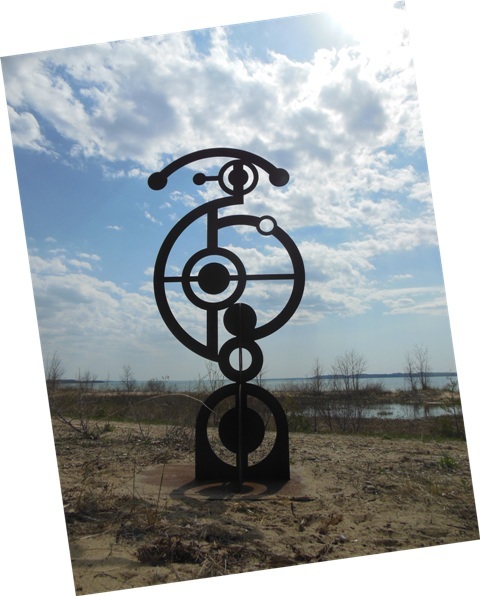 Saturday, June 21, 9:00 pm: Stone Circle opens for the season. Heaven’s, I’m breathless. You seem to be making up for lost time with a vengeance. Keep lying on your back to take photos. Even if they don’t work out to your satisfaction, you will get very fit doing it and I will have an internal and discreet chuckle imagining you at work. Sometimes, whether intentionally or by misadventure, I lie on my front to take photos. A person can find interesting things that way: ice caves, spiders, nice rocks. A person can also ruin a lot of little cameras. This is so true. May all your falls be into soft places. Thank you. We are well-supplied with soft sandy places all over the County, which is why I have managed to survive this long. Awwww…we had such fun! Katie still dreams about the whole adventure. Elk Rapids is such a great town, and we loved having you show us around. I hope the library job continues to be a fun way to earn some money, it’s a dream job for me…maybe someday. Thank you again for giving us your entire Saturday! Sharing Saturday with you and the princess was a delight. There are lots more things to show you, and you’re welcome anytime. A wood fired pizza oven? Sounds wonderful. If looks are anything to go by, the pizza ought to be delectable. Pizza and live music. What’s not to love? It produces very satisfactory results. It’s attractive, too. I took pictures but they’re no good. Must get Babs over there to do it all justice. It all looks gorgeous. I’d love to come and visit some day. I found the US and its people really inspiring when we visited last summer and your part of the country looks even more delicious than California. Come on over, Joss. We are delicious in a different way than California. Savor the differences . . .
Oh, my, Gerry, this post was worth waiting for! You’ve got a job at the library?! How much more fantastic could that be? And Dawn and her princess visited? And Glenn Wolff on a regular basis? And on and on!!! Makes me wish more than ever (and that’s a lot) that we had a car ferry between my side of Grand Traverse Bay and yours. All those good things are true, and I am happy about them. Of course, I did not have a baker’s dozen poets at the Writing Studio and Bait Shop. 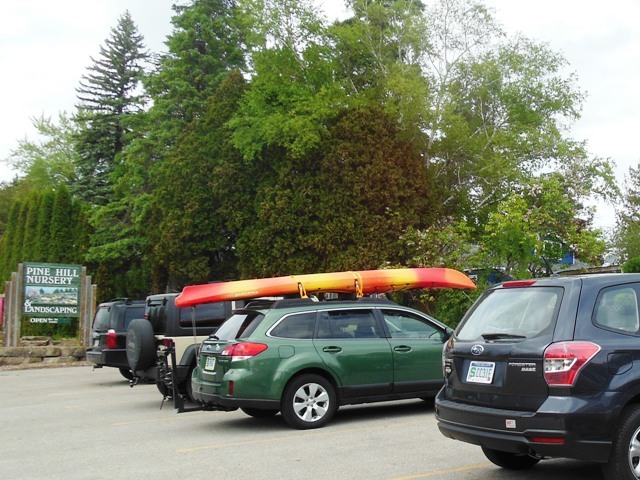 Leelanau may have the edge yet. The ferry would be the answer. First, I had to get past that pizza, which wasn’t at all easy to do. Then, I admired your lean-y photo. Steve Schwartzman, the photog who stops by my blog from time to time, takes photos of flowers — mostly macro. He’s not at all shy about getting down to ground level to do it, and told a great story about a motorist along an Austin highway stopping once to see if he might have had a heart attack and needed help. I do love the yellow iris. I just found out that “flag” is another name for them. Wild flags. Yellow flags, And so on. They do wave about a bit, but I can’t swear that’s how they got their name. I followed some links and got to a few of the kids’ poems from Terry Wooten’s school workshops. I enjoyed those, a lot. You’re right about the iris. They started out as garden escapees a long time ago and selectively bred themselves into hardy survivors. 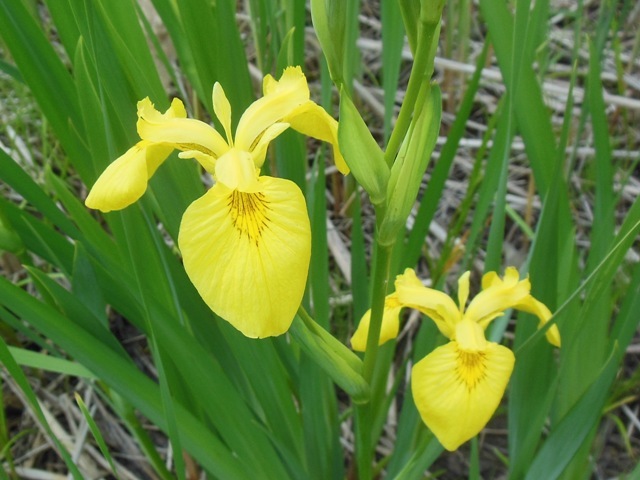 We have yellow flag and blue flag iris. They don’t seem to grow together. Terry’s work with kids is legendary all across Michigan. I once volunteered at an autumn gathering of some 300 elementary/middle school students up at Stone Circle, brought by busloads and accompanied by teachers and parents who were really happy to be there. I was happy to be there too. 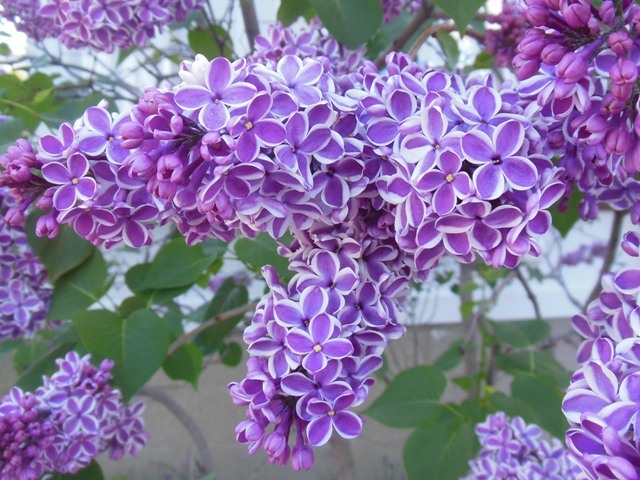 I’ve never seen a two-toned lilac bush either. Wonders never cease. The smell of lilacs is early summer. We skipped late spring here too and seem to already be feeling the uncomfortable warmth that a sudden summer sometimes delivers. I doubt many are complaining though. We haven’t started complaining about the heat yet either. Usually the worst whining happens in August, so we have time. Miss Sadie and the Cowboy could run for help (Gerry’s in the well! Gerry’s in the well!) – but would they? I can see them getting distracted by forbidden food sources, passing porcupines . . .
Love everything you write, Gerry. Miss you and so does Alden. Please come to visit again. The new hanging planters will blow you away! I’ll bet they will – Alden always makes me smile. One day soon I must get over there and celebrate.